Our interview this morning is with David Sacks, CEO of Geni.com, an online family tree and social networking site, as well as Yammer, the instant messaging startup spun out of Geni.com at TechCrunch50. David has a unique perspective on the Southern California technology environment, having been the COO of PayPal before its acquisition by EBay, and having had the full Silicon Valley experience. We sat down with David to catch up on what Geni and Yammer are doing, plus got his insights into entrepreneurship and the Paypal mystique. Thanks for sitting down with us. First off, how are things going with Geni.com? David Sacks: As you know, Geni is creating a family tree of the whole world, and layering in a family social network and family wiki on top of that. We want to become a place to connect and preserve the family. In terms of how we're doing, we're growing really fast. We're up to around 2 million users who have created 30 million profiles on the site, and it's growing very fast month over month. What's the ultimate business model behind Geni? David Sacks: We think that it's a combination of a few things. One, is we plan on having a subscription product for Geni.com, sort of like a premier account, but one you can also buy for your relatives. We also think there's a bit opportunity in family gift giving, and we've also partnered with a number of sites to enable that. Advertising might be number three. Ultimately, I think we've got a pretty deep relationship with our users, and ultimately we want to get our users to pay for things as opposed to just making money from CPM advertising. Most social networking sites have a problem with having lots of pageviews, but advertising that isn't very valuable. We have a very deep relationship with our users, and our most active users have archived their entire family lives on Geni, so we think there are lots of products they'd be interested in buying. How'd you decide the family tree area was the right place for a startup? David Sacks: We started a little over two years ago, after we had the central insight that at the product level, the family tree could be viral. Before that, creating a family tree was a solitary activity. You could just sit and add people to your own family tree program, but people hadn't applied Web 2.0-style, mass collaboration and user generated content to building a family tree. What we realized is that when you add someone to your family tree, you can put in the email of any living family member, invite them to the site, and they can add information to. Now, let's talk about Yammer. How did Yammer come about? David Sacks: Yammer started as an internal productivity tool at Geni. We basically built the tool to help people stay connected, and we've been using it internally for six months. We have about 30 employees at Geni, and have about 20,000 message on yammer. it's been incredibly successful at Geni, and is the center of the company's culture. We recently decided we should spin it out into a separate company, so that other companies can use the product as well. About a month ago, we spun it out and premiered it at TechCrunch50, as you know, and won that event. What's the plan now for Yammer--are you going to run both companies? David Sacks: For now, I'm running both companies, though over time I might have to figure out a different arrangement. It works well for now. You're in a unique position having been at a successful Silicon Valley firm, and now running two startups here in Southern California. Can you contrast how the experience has been and the differences? David Sacks: I think L.A. has been a good place to start a company. There are fewer engineers and technology people in L.A. compared to Silicon Valley. On the other hand, there are fewer attractive startup opportunities, and as a result we've had a pretty good experience recruiting talented engineers. We're pretty happy starting a company down here. If we were in Silicon Valley, we'd just have a lot more startups to compete with in terms of recruiting people. How did you end up here in the first place? David Sacks: About six years ago, we sold PayPal. 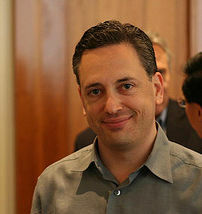 I was the COO of PayPal when it was a public company, and sold it to eBay. After that, I left, and decided to do something new. I moved to L.A. to start a production firm, and produced Thank You For Smoking. we had some success, but around 2, 2 and a half years ago I decided go back into the Internet, because there were so many interesting things going on. I like to say that movie producing is now a hobby, because it's hard to see it as a business. There's a lot of attention given to PayPal alumni in startups. What's your take on the the amount of attention given to them? David Sacks: There's a lot of PayPal alumni who have become very successful companies. Chad Hurley and Steve Chen of YouTube--Chad used to work for me at PayPal. There's Reid Hoffman at LinkedIn, Jeremy Stoppelman at Yelp, Max Levchin founded Slide--there's a number of successful and high profile companies founded by PayPal alumni. It's because we had a very entrepreneurial company culture. They all learned a lot from the PayPal experience, and have gone on to do interesting things. What was it about PayPal that encouraged such an entrepreneurial culture? David Sacks: PayPal was largely built after the crash in 2000. We launched the web version of PayPal around November of 1999, and the crash happened something like four months later. We really had to make the company work in the wake of the dot com crash. It was a very difficult environment. As a result, we didn't encounter the kind of fast, easy success some companies built pre-1999 encountered. We were really tested, I think. We had a really good team, and I think we're learning that now. Are you carrying that culture to Geni/Yammer, and how? David Sacks: In a sense. We're completely product focused, and I would say that the one thing we learned at PayPal was that the product is the most central thing. Getting it right is the most important thing. There's lots of other things you can focus on, but getting that product right is the most important, I think. The post-PayPal companies have embraced that. Here at Geni and yammer, we're just making the product better and better, and keep iterating to make it better.